4-H is a community of young people across America who are learning leadership, citizenship and life skills. 4-H is about having fun through experiential learning. In 4-H, young people make new friends, develop skills, become leaders and assist in shaping their communities. 4-H gives youth a chance to pursue their own interests – from photography to computers, from building rockets to raising sheep. A list of 4-H projects is available online. They go places – to camp, to state and national conferences. They learn to be leaders and active citizens. 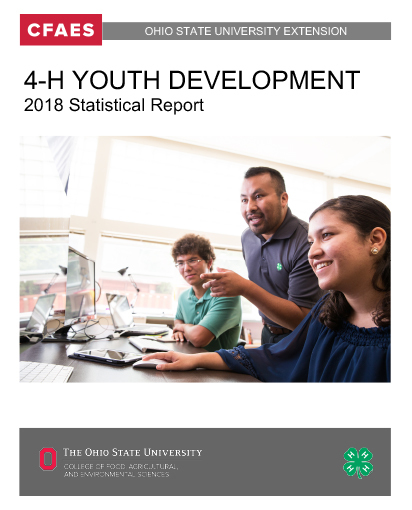 Below you will find the Ohio 4-H Youth Development Statistical Report for program years 2001-2014. These reports contain an overview of Ohio's enrollment data (2004 & 2011 Statistical Reports are not available).